Attorney David W. White is interviewed by NBC Boston on the next steps ahead for buyers after the Dorchester building fire tragedy. 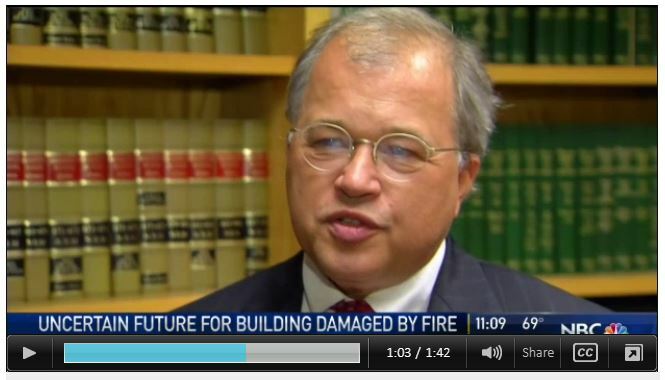 (June 29, 2017) Attorney David W. White was interviewed by NBC Boston on the potential legal options ahead for buyers of condos destroyed by a massive blaze in Dorchester. The fire went up on Wednesday, just a day before a fire inspection was reportedly scheduled. The six-story Treadmark building had 83 units, including 32 for home ownership and 51 for affordable rentals. It was located in the Ashmont section of Boston’s Dorchester neighborhood.